October is Breast Cancer Awareness Month. Gather your friends, family or colleagues for a Big Pink party and raise money to help us support anyone affected by breast cancer. Whether you have a pink clothes day at work or a pink night in, your Big Pink can help us make a difference. Sign up now to hold your Big Pink party. Due to popular demand for this years Big Pink we have run out of fundraising packs but we have everything you need for your Big Pink party available to download online. Every year we hold a Big Pink in our ice cream parlour to raise money and awareness in our local community. The kids still get involved and it’s a great way to support my wife who finished treatment five years ago. 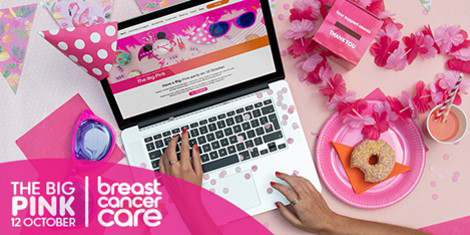 Hold a pink bake-and-buy sale in your workplace. Have a pink night in with friends and donate what you would've spent going out. Have a competition for the best dressed pink partier! Make your party the biggest pink of all. Order extra items to add to your free kit. Our Moving Forward courses provide practical tips on managing side effects and finding a 'new normal'. Our monthly sessions allow people to talk openly in a safe space with others who may share their experience. We put people in touch with a trained volunteer to discuss anything from genetic testing to fertility concerns. Our online Forum community and app, BECCA, can offer support at any time of day, wherever someone may be.